I intend to take each part of the Recipe, physical, mental, and spiritual, and explain why it is in the Recipe and what it is doing for you in your recovery, deeply drilling down to the how and why it is helping you recover from Parkinson’s. Today is the thirteenth part: reconnecting with the soul and opening the heart for dopamine flow. I began my recovery journey with faith in my full recovery. I considered this to be the beginning of healing my soul, which really was a reconnecting with my soul, or the essence of my being; reconnecting, that is, with the essence of who I was before I started making changes to the essence of my being. I feel we are born with a purity and innocence that we adjust and change and lose somewhere in life, and it is the return to that beginning, the re-connection with that beginning, that re-purifies us and helps up re-connect with our soul. Parkinson’s is toxic, and it is the Recipe’s re-purification of the body, re-purification of the mind, and re-connection with the purity of the soul that purifies us entirely…and then there is no Parkinson’s…it only can reside in a toxic environment…it has to leave. And we are liberated! Your body is an accumulation of food and drink, etc. over the course of your life. Your body has Parkinson’s symptoms. You are not that body. Your mind is an accumulation of thoughts and ideas and emotions and fears, etc. over the course of your life. Your mind has Parkinson’s negative emotions and fears. You are not that mind. Your soul, the essence of who you are, remains pure. However, as a result of being so focused in life on what is going on with your body and with your mind, you make adjustments to the pure and innocent essence of your beginning, and your soul gets buried deep inside you. But It is there, and always has been with you. And It remains pure and untouched by Parkinson’s. So, whatever is your belief system, the Recipe healing of the soul can work for you. It does not matter if you believe in a soul or essence. It does not matter if you believe in a Higher Power or God, or Greater Consciousness or that we are just here in this world — there is something inside every one of you — that something deep inside that when you have faced insurmountable odds in life, you have reached down deep inside and felt that something, and you have defied all logic, and accomplished whatever it was that nobody thought was possible. Trust. You trusted in yourself. And you had faith that you would do whatever needed to get done. And you dug down deep and found whatever It was inside you to give you the ability to reach the end. It is that spark inside you. That spark you used to go to when you needed a boost of energy or a smile on your face in hard times or that sense that there was a greater purpose in why you are here. Some people call that spark soul; some call It essence; some call It a part of God or the Higher Power or the Divine; some call It part of the Greater Consciousness; some call It an electrical charge. It does not matter what you call It, It is there, and you need to re-connect to It and know It will help you in your recovery. It is the basis of faith. In the previous post, I wrote about calming the mind. Two important components of calming the mind, acceptance and getting out of the fear-based Adrenaline-mode mind, have a basis in faith. So, everything that has happened in your life right up until this moment was part of your existence. If you extract judgment of yourself from your mind, then you can accept that everything in the past had a purpose whether you understand it or like it…it is in the past…just accept that it had to happen exactly how it happened and you never have to look back and judge yourself again. This is an important part of freeing your mind and liberating your life. The past is exactly that: THE PAST! Let it go and you let go of self-judgment, self-criticism, self-loathing over what should have, would have, could have been. To assist you with achieving this level of acceptance, think of someone or something that exists right now for which you are grateful. If there are things in the past that you do not wish to accept had to happen exactly how they happened, how do you know that the changing of one thing to negate those things would not have had the result of setting off a course of action that the “someone or something for which you are grateful” ceases to exist in your life right now. Accept the past without judgment of yourself. If you woke up each day without a memory of the past, you would be prepared to accept the day as it rolled out in front of you. There would be no judgment of “now” compared to “the past” because the past would cease to exist. There would be no “my symptoms seem worse today than yesterday.” There would be no “I should have done it this way instead of that way.” There would be no self-judgment, self-criticism, self-loathing over what should have, would have, could have been because the past would not exist in your mind. Faith and Fear. Acceptance closes the door to the past. Letting go of fear closes the imaginary future. “Fear and negative thoughts are a constant battle with the disease. Although I had a very positive attitude that some day I would recover, fighting the disease mentally and spiritual was a daily war. I learned that God was in a much better position to handle my fears and negative thoughts and that I needed to give them away so I could stay focused on my recovery. Click here for another way of ridding yourself of fear. Faith and Joy. Opening my heart for cultivating positive emotions was the key to opening my dopamine faucet and finishing my recovery. Here is how I did it. I do not know much about the subconscious, but it was my understanding that if I felt bad about myself and left those feelings unresolved, they could grow over time into a subconscious feeling of being undeserving or unworthy of my final recovery. I found some times where things were said and the net result was that I did not feel good about myself, and I worked them through and gave them finality. I did feel better about myself after having accomplished this. (More on this in the next two days). And then it hit me…in staring at these words, I asked myself, “Where is the guy who knows he will be fully recovering from Parkinson’s? 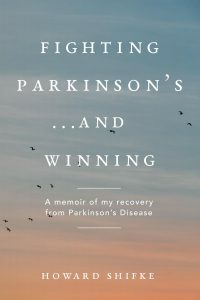 How is he now the guy describing his Parkinson’s as a life-long battle?” And it came to me — many people had been so negative and so disbelieving of my fighting Parkinson’s without medications and saying I would have a full recovery, that I had fallen back into my old “safe-place” habit when faced with potential disapproval…I had become willing to keep Parkinson’s to my detriment just to make other people happy because if they were already negative toward me just with what I was doing in my treatment, how would they act toward me when I fully recovered. That was five and one-half years ago. I have not been doing the Recipe, and I remain symptom free. I am cured. It was in my moment of realization at the end that I was able to connect my soul, my essence, my inner spark, to God, the Higher Power, the Universe, the Greater Consciousness, the healing electricity flowing around us and through us, and feel that I was a part of everything just as I was when my soul and my heart and my essence first were inside me. And my old-self Parkinson’s was no longer there…just I remained…symptom free, fully recovered, cured. And you have not let go of It. Now, it is time for you to explore within yourself what may be holding you back from your full recovery. If you do not feel like you are deserving or worthy of this recovery, then you need to explore why, and get it resolved. The next two posts will assist you with this part of the journey. It starts with faith, and It ends with faith. Faith is a choice, and it is the choice that leads you on your path with the Recipe toward your recovery from Parkinson’s. Thank you, Howard….such a vital post for me…I was able to remember times in my life when I was most present…times when I absolutely let go of my past and had faith in myself. These times were those in which I most contributed in life…to myself (because I knew I was making a difference) and to others….Essentially, I realized the importance of standing in my own knowing. Now I am working on what many might interpret as my greatest challenge…but PD is my greatest gift for it is asking me to dig deeper…and to really stand in faith and in trust with what I know to be true. Thank you and our dear PD community for your enduring support and love. i had a major collapse brought on by fear and lack of faith and gave into what felt like enormous pressure to take the drugs against my heart felt wishes, Now with Howard will find the way out and forward. I didnt realise what was happening, and now am still knocked sideways and gradually reaching for help within and without. hola querida Mayarita, tu corazon es fuerte, permiteme platicar esto a ti. hace casi un año , escribi aqui mismo la experiencia que en ese momento de incertidumbre y desesperacion, yo estaba atravesando, cuando mi cuerpo se sentia tan debil que yo no podia alzar los brazos para ponerme una camisa , yo sentia tanta debilidad que dificilmente podia dar algunos pasos sin sentir que iba a caer al piso, en esos momentos el miedo me invadio. comente en el blog que mis hermanos al verme asi tan debil, me pidieron, casi me exigieron que yo tomara medicamento, yo estaba casi convencido de tomarlo, fue algo que comente aqui con ustedes y me quede asombrado de las muestras de apoyo que recibi, muchos comentarios hermosos alentadores, para que yo no ceder a la presion de la familia por tomar medicina ,,estas muestras de apoyo me fortalecieron, y tambien dentro de mi habia algo (MI ESPIRITU ) que me decia no te rindas sigue adelante , tu puedes hacerlo , continua haciendo la receta . entonces surgio un razonamiento muy logico,que me levanto el animo…… si hacemos la receta con un verdadero compromiso con nosotros mismos ,por amor a nosotros mismos, el resultado final tarde o temprano sera la recuperacion de nuestra salud. permiteme decirte e invitarte a que veas el aumento en los sintomas con la siguiente optica, . Si tu estas haciendo la receta para la recuperacion, lo que nosotros vemos como aumento en los sintomas, no es mas que la inercia de los mismos moviendose en el tiempo,, pero al hacer la receta ,, la curacion se esta llevando acabo por dentro , hay cambios positivos en nuestro interior dia a dia y por consiguiente esa inercia que llevan los sintomas se esta reduciendo cada dia que hacemos la receta y asi se ira reducira hasta su minima expresion. todo esto me ha dado el valor para seguir adelante con mi lucha , hoy mi cuerpo no esta tan debil, aunque aun tengo muchos sintomas como lentitud, falta de cordinacion , falta de destreza, rigidez, rueda dentada , fatiga, se que todo con compromiso y seriedad saldre adelante y los sintomas desapareceran, asi que Mayarita mucha fuerza interior , tu eres un gran espiritu y algo que te puede dar mas fortaleza es tu bebe . que dios te bendiga y feliz año nuevo a todos. Mayarita hello dear, your heart is strong, let me discuss this with you. Almost a year ago, I wrote here the same experience in that moment of uncertainty and despair, I was going through, when my body felt so weak that I could not raise his arms to put on a shirt, I felt so weak that I could hardly give some steps without feeling it would fall to the floor, at the time the fear invaded me. comment on the blog so my brothers to see me so weak, almost demanded that I take medication, I was almost convinced to take it, was something to discuss here with you and was in awe of the outpouring of support I received, many beautiful comments encouraging, so I would not give in to family pressure by taking medicine ,, these expressions of support strengthened me, and also there was something inside me (my Spirit) told me not to give up continues, you can so, continues to make the recipe. then came a very logical reasoning, which cheered me …… if we make the recipe with a real commitment to ourselves, love ourselves, the end result will eventually recovery of our health. let me tell you and invite you to see an increase in symptoms with the following optician. If you’re making a recipe for recovery, which we see as increased symptoms, it is nothing but the inertia of moving in the same time ,, but ,, to make the recipe healing is taking just inside there are positive changes within us every day and therefore the inertia symptoms that lead is shrinking every day we do the recipe and thus reduce will go to minimum. all this has given me the courage to go on with my struggle, today my body is not so weak, but still I have many symptoms like sluggishness, lack of COORDINATION, lack of skill, strength, sprocket, fatigue, is that everything with commitment and seriousness saldre forward and symptoms disappear, so Mayarita lot of inner strength, you are a great spirit and something that can give you more strength is your baby. May God bless and happy new year to all of you. Beautiful Howard and much needed. Thank you.